Roman baths were an integral part of Roman life. 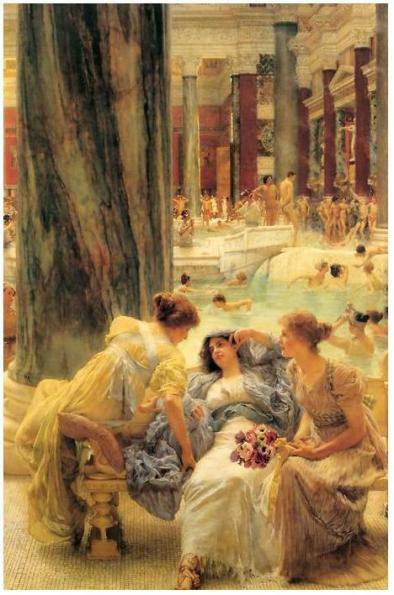 Unlike later times (from the Dark Ages up until the 19th century), bathing was very common in ancient Rome. Most Romans of all social classes would bathe almost everyday, if not everyday. Even poor Romans would go to the public baths many times a week. Roman baths follow the Greek tradition of bathing. Ancient Greeks had thermal complexes that were built on natural springs and carved into the rock. People then believed that these springs had healing powers and they would leave offerings to their ancient gods. Greeks bath houses contained bathtubs and had niches cut into the rock where bathers would leave their clothes. They were beautifully decorated and some have been found containing beautiful mosaics. But the Romans took the building of Roman baths to another level. Romans did not bathe the way we do today. For most Romans, bathing was done in public. Only the very rich could afford to have their own bathing facilities and saunas in their villas. Romans would bathe in thermae which were similar to modern-day saunas. Another difference is that these saunas or thermae were places where people would hang out and socialize. Romans would discuss business matters, court women or just relax. Baths were literally a part of Roman life. People would bathe not only to clean themselves but also for the health benefits associated with being in a sauna. A thermal complex built on a hot spring was used to cure diseases or to relieve pain. For example, (older) people who suffered from arthritis or people who wanted to lose weight or even people with a hangover after drinking too much wine would go and spend some time in these ancient Roman saunas. Romans copied the Greeks but took the building of Roman baths to another level. 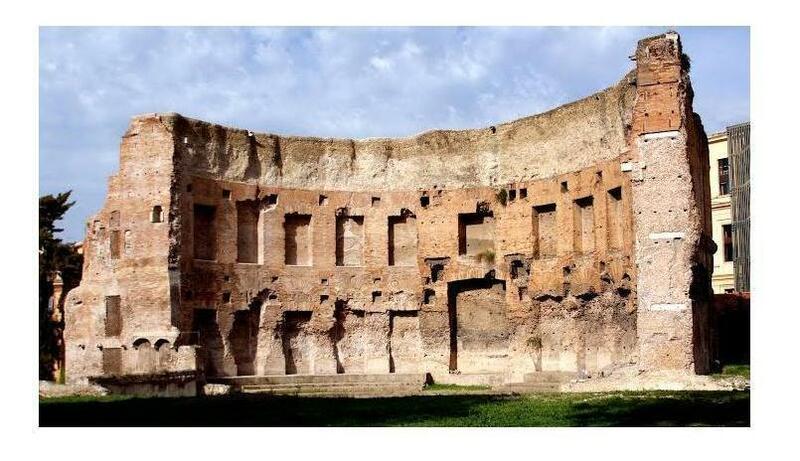 By the 4th century AD the city of Rome had close to 1,000 public baths! Roman baths were also build in forts for the army. Initially most bath houses were built on natural hot springs or tidal pools. 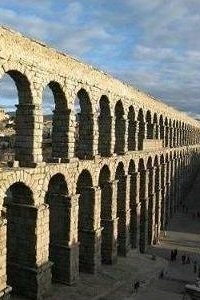 But with the introduction of the aqueducts, Romans built them everywhere. Water that came from the aqueducts was heated in the bath houses. There were two kinds of Roman baths: the thermae which were large baths and the balneum which were much smaller in size. The thermae were owned by the state while the balneum were generally privately owned. Both types charged a small fee for entry which most Romans could afford. The Baths of Diocletian which were built around 300 AD and which could hold as many as 3,000 bathers at a time and the Baths of Caracalla built around 215 AD were among the largest baths ever built by the Roman state (see painting on the right: The Baths of Caracalla by Lawrence Alma-Tadema). Roman bath houses had a large symmetrical facade and many entrances, usually three. There was an entrance for men, another for women and another for slaves who worked at the facilities. There often was an open courtyard inside called the palaestra which was surrounded by beautiful colonnades and which was used to exercise or to swim (as it sometimes had a swimming pool). As we previously pointed out, baths varied in size (there were the thermae and the smaller balnea). The size of the baths varied and the decorations would go from simple to very elaborate. When entering a Roman bath house, a bather would go from one room to another and would be exposed to gradually increasing temperatures. He would start from the apodyterium which was like a locker room. Then he would move to the frigidarium with would contain cold (frigid) water. 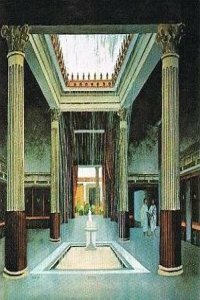 Then he would go to the tepidarium which was a warmer room and then to the caldarium which was a very hot room. Some baths also had a laconium which was a dry room that was used for resting. Below the hot rooms, there was a hollow floor where fire would burn. Inside the caldarium there were also pools with cold-water used by bathers in order to could cool down. After the caldarium the bather would go back to the tepidarium for a massage and for cleaning. Actually cleaning was not done by showering but rather by scraping the skin with a metal. Romans would usually cover their body in oil (during the massage) and then scrape this oil off their skin with a metal. 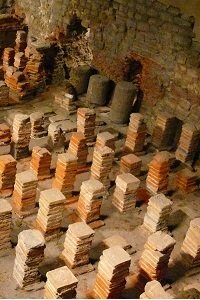 Roman baths often had large libraries were Romans could read and rooms that served food. 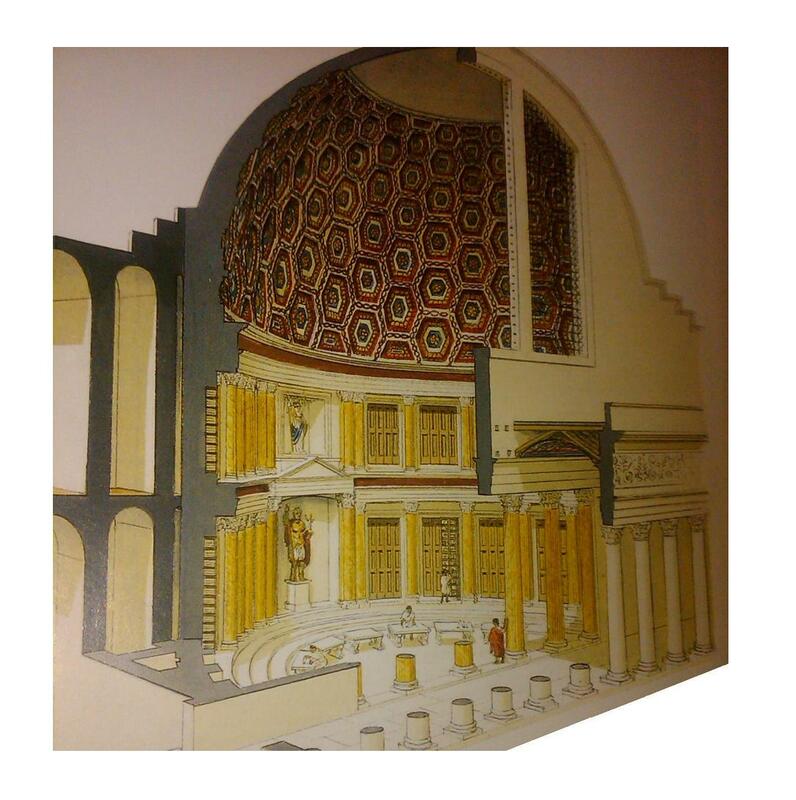 The illustration below shows how ornate the library at the Baths of Trajan was. There were even little shops set up that would sell perfumes (used after scraping the oil from the body). The court was usually used to exercise and there were also rooms that functioned as gymnasiums. Roman baths were beautifully decorated. Inside there were lots of beautiful statues and fountains. The floors and walls were often covered with marble and beautiful mosaics (for example of trees or animals). They often had domes that were painted blue to look like the sky. Roman baths originally separated men and women. During the Republic they were divided by a wall with the section for women being usually smaller than the one for men. During the Empire, it was common for bath houses to be mixed. Some associate this with the Roman decline which is also associated with the moral decline of the Roman Empire. It is said but not confirmed that Emperor Hadrian banned mixed baths but that the ban did not last long after his death. Most bath houses in Rome functioned until the Goth invasions in the early 6th century AD which led to the destruction of the aqueducts and the letdown of facilities. Baths in the palace complex, Knossos, Crete, Greece. 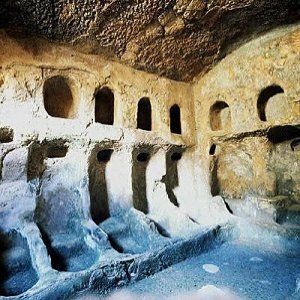 Built around 2500 B.C..
Alabaster bathtubs, Akrotiri, Santorini. Built around 2500 B.C..
Serangeum, Greece. Built on hot springs, the Greeks cut bathing chambers into the hillside. The chambers had beautiful mosaics on the floor. Baths of Diocletian. The Baths of Diocletian were the largest baths ever built in Rome. There were built between 298 and 306 A.D. by Emperor Maximian in honor of Emperor Diocletian and can still be seen today in Roman. Baths of Trajan, Rome, Italy. Built in 104 A.D. by Emperor Trajan and used until the beginning of the 5th century with the Goths invasion. The baths were huge (about 200 meters by 300 meters) and were used everyday by thousands of Roman citizens. The remains of the baths can still be seen in Rome today. Baths of Caracalla, Rome, Italy. Built around 215 A.D. by Emperor Caracalla. The baths were free of use and they contained many beautiful statues that can still be seen today at the Naples National Archaeological Museum (the Farnese Bull and Farnese Hercules). The site can also be visited in Rome. Baths of Agrippa, Rome, Italy. Built around 20 B.C.. Some ruins can be seen in Rome. Suburban baths, Pompei. Built around 100-50 B.C. and baths were well preserved and can be seen today in Pompei. Baths of Puteoli, Pozzuoli, Italy. Some ruins can still be seen in Pozzuoli. Trier, Germany. Trier has the third largest preserved Roman bath house in Europe. Varna, Bulgaria. Built in the 2nd century A.D.. The ruins are considered the 4th largest Roman baths in Europe. Bath, England. Built around 100 A.D. on hot springs. Strumica, FYROM. Strumica has Roman bath ruins that are in relatively good condition. Ankara, Turkey. The baths of Ankara were built in the 3rd century A.D. by Emperor Caracalla. Other Roman baths can be found in Algeria, Bulgaria, France, Germany, Hungary, Israel, Italy, Lebanon, Libya, The Netherlands, Portugal, Romania, Spain, Tunisia, and the UK.